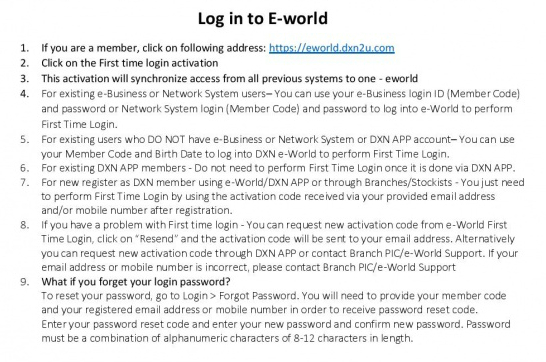 DXN e-World is a One Account access for all the DXN Systems (DXN e-World and DXN APP) with the same account login. The main objective is so that members can conveniently make online purchase, check Group Sales/Bonus report, recruit new members, and enjoy various features of the DXN e-World. Swift periodical updates for News & Events and latest products. News & Events will be synchronized with the DXN APP notification. DXN e-World can be accessed anytime and anywhere through various mediums such as mobile web and tablet browser. Better security to control and protect members’ accounts. First Time Login activation is to synchronize all member access from various systems into one single account access and to capture the latest contact details from existing members. Once your account is activated, you can use the same LOGIN details to log into our DXN APP. You may download the DXN APP to enjoy the various features provided by DXN, anywhere and anytime. Note : If you have an account in ePoint, e-Business and/or Network System, you only need to do ONE TIME“First Time Login” activation. If you are not a DXN member yet: Join DXN now! New prospects are welcomed and cordially invited to access the e-World system “New Register” Menu and join as a DXN member to enjoy all the benefits from DXN. If you choose us as your sponsor, our DXN sponsor code is 310007879 .